The Evening Standard Theatre Awards, established in 1955, are presented annually for outstanding achievements in London Theatre. Sponsored by the Evening Standard newspaper, they are announced in late November or early December. They are the equivalent of the Broadway theatre Drama Desk Awards. The trophies take the form of a strongly modelled statuette, a somewhat Grecian figure representing Drama, designed by Frank Dobson RA, a former Professor of Sculpture at the Royal College of Art. 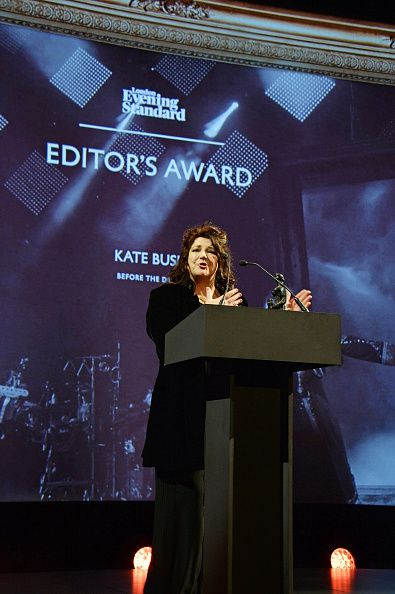 Kate Bush won the Editors' Award in 2014 for her Before The Dawn live shows. She accepted the award from Sir Ian McKellen and gave a speech thanking everyone involved. Evening Standard Theatre Awards. Wikipedia, retrieved 1 November 2018.